SAN DIEGO (AP) Tiger Woods is starting another year at Torrey Pines, this time with higher expectations. 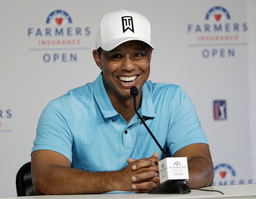 Woods announced Wednesday that he will play in the Farmers Insurance Open next week. He has won the tournament seven times, and Torrey Pines is where he won the U.S. Open in 2008. Woods tied for 23rd a year ago when no one - himself included - was sure what to expect. He was coming off a fourth back surgery, this one to fuse his lower spine. This will be his first PGA Tour event since he won the Tour Championship last September to cap off a comeback year.